Inductivist: Happy Birthday to me! I suspect as many middle-aged (and later) women keep waiting longer and longer to -ever- get their grandchildren, and family get togethers consist of too many adults and too few children, even some liberals will begin to see that children are blessings and not curses. I guess Napolitano and the DHS have an even bigger problem than they thought, what with this increase in the number of "extremists" out here. how much of this shift is just a reflection of the larger hispanic demographic? It can't be very much of it. The big jump is over the past 3-4 years. Hispanics only when from about 14% to 15-16% of the U.S. population over that period. And even Latino immigrants are divided on the abortion issue. Native-born Hispanics are similar to whites. 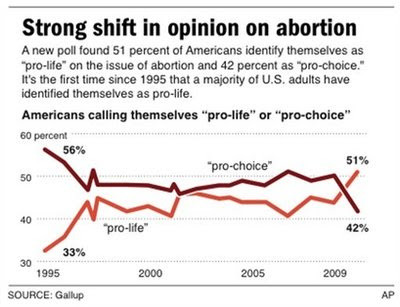 An important question is how many "pro-life" people nevertheless think abortion should be legal.